For the longest time, I thought I just wasn't a jeans kind of girl. Crazy, I know. But for most of my life, the only jeans I encountered were the kind that stretched out much like leggings do or worse, were so thin that they revealed everything that lies beneath. While some of those styles are comfy as hell, they just didn't do it for me. So I kind of lost faith in denim altogether for a while, opting instead for trousers and skirts. One day, though, I picked up a pair of vintage jeans and quickly became obsessed with their rigidity and shape. Here were jeans that held everything in place and kept their shape throughout the day. Oh, and they fit so, so well. I thought it was impossible to find the same vintage-inspired material by shopping brand-new, but I was wrong. It took searching far and wide, but I've finally narrowed in on five of the only denim brands I'll trust for rigid jeans. Thanks to how picky I am when denim-shopping, I've learned how to tell the good from the bad and the rigid from the stretchy. It's all about the fabric breakdown, so check those labels. One hundred percent cotton (aka zero stretch) is like denim gold in my book, but I've also found that anything 95% cotton makes the cut. I always buy true to size, too, since jeans with a high cotton content are almost guaranteed to stretch out a tad and mold to your body after a few wears. Ahead, I'm breaking down which brands I can count on and exactly what makes their jeans so rigid. There's a reason vintage Levi's are the gold standard of rigid jeans, and it's because they take great care to develop their fabrics. Jill Guenza, global VP of women's design at Levi's, shared, "The perfect rigid fabric is all about comfort and moldable structure. We offer a range of soft yet structured fabrics in our 501s and Wedgie fits, from 100% cotton to a mix of 98% cotton and 2% elastane. The small amount of stretch in our 98/2 fabrics provides just the right amount of comfort while holding and molding like a classic pair of vintage Levi's. However, even our 100% cotton shrink-to-fit fabrics that we offer in 501s and Wedgies have more give than other cotton fabrics because of the special method of weaving." Available in sizes 28 to 32. I adore J Brand's jeans because they're certainly rigid, but the denim itself is thinner than most vintage pairs I own, making them wildly comfortable. 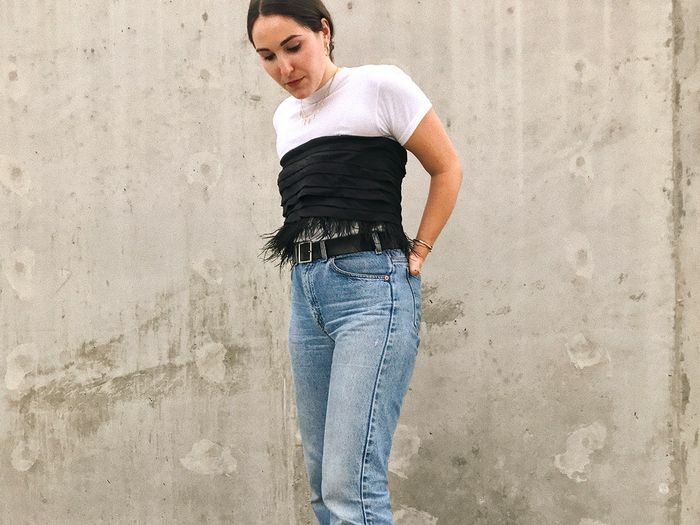 According to the brand, "our Joan High-Rise Crop in Optic White and the Heather Button Fly-Jean in Overthrow/Electrify are two of our most rigid denim styles at the moment. Rigid technically is 0% stretch so when shopping for rigid jeans you should look for denim with no elastane (stretch). In terms of sizing, its best to buy rigid jeans pretty tight (almost where you have to lie down to get them zipped) as rigid jeans do stretch out after wearing." Available in sizes 27 to 32. Grlfrnd is another favorite of mine because every denim shape across the board is made without stretch. The VP of buying and merchandising, Lauren Yerkes told me that they "have a core program that consists of all rigid styles plus all the key bodies are done in 100% cotton non-stretch. The Karolina group are our best-selling rigid styles, but we also have a rigid stretch program that consists of 1% stretch that still gives it a vintage feel." Re/Done's line of reclaimed vintage jeans hardly needs an explanation as to why each pair is so high-quality. At a certain point, shopping for vintage jeans became a tiring process. I had to try on every pair I encountered because you never know which could be The One, aka the one pair that ends up fitting you like a glove. Co-founder Sean Barron shred what it is that you should look for when jeans shopping: "Shoppers should definitely look for a jean that has no give and a bit of weight to the denim. Other than that, it’s about fit. The fit is crucial when shopping for rigid denim. We have so many rigid styles because we want everyone to be able to find the perfect rigid jean for their liking." Once I slipped into a pair of Re/Dones, I finally understood what all the hype around the brand is about: vintage-quality jeans tailored for a modern shape and fit that you can easily add to cart without lifting a finger. Agolde is another brand I love because of its commitment to 100% cotton with each new style it makes. Look no further for on-trend shapes that won't actually cost you an arm and a leg. Next up, shop the denim trend that everyone will wear for fall.